Does green tea affect thyroid? Green tea is a huge trend. Green tea is supposed to be really good for you, but is it? I want to tell you by way of disclosure that I love green tea. But I seldom drink it anymore. Nowadays I drink mainly coffee. This study is one reason why I do not drink much tea anymore. Does green tea affect for healththyroid? Is green tea bad for you? Some cultures in Asia drink a lot of green tea. And in those places, such as Japan and China, people are generally smaller. They’re not as tall not as big. Ant there have been theories put forth for their smaller size. One theory think that this smaller size may be due to the side effects of green tea. Green tea may be one reason why Asian people tend to be smaller. Green tea contains thousands of chemicals. It contains fluoride in high quantities, as well as caffeine. It contains a whole host of compounds called catechins, which are thought to have some anti-cancer potential. So researchers wanted to find a way to study the effects of green tea on the body. What was clever about this study is that they were able to isolate the effects of green tea on the thyroid. They gave mice a fair amount of green tea. It was the equivalent of you and I , 1 to 2 L of green tea per day. That’s really not that much when you think about it. A lot of people drink more green tea than that every day. What the researchers found was that green tea depresses the thyroid gland. 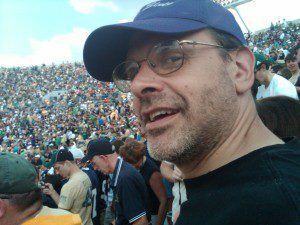 The depression is fairly significant too. It depresses both T3 and T4. 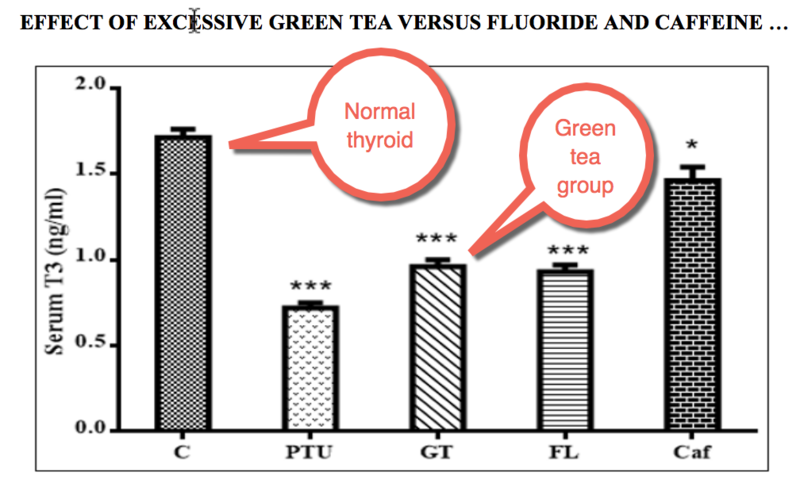 Here’s a chart showing how much lower green tea makes the thyroid function. You can see from this chart that the GT (Green Tea) group had significantly lower thyroid function. They also gave certain mice fluoride, and they found that fluoride also lowers thyroid quite a lot. It would be reasonable to conclude then that the high amounts of fluoride in the green tea is the culprit. However, the green tea without fluoride also lowers thyroid. an indicates that it is a function of green tea causing the thyroid result rather than the fluoride found in tea. Green tea decreased serum T3 and T4 and at the same time. One question remains: does the same effect also happen with black tea? There have not been studies done on black tea, but I would imagine that black tea also lowers thyroid function. Black tea contains most of the same compounds as green tea. In fact, black tea and green tea are quite the same in their therapeutic benefits. So it is likely that black tea will also reduce thyroid function. So, does green tea affect thyroid? Yes. I would suggest that you definitely should not drink tons of green tea. There are a lot of other issues with green tea such as the fact that catechins tend to be estrogenic. There are also some benefits to green tea. Some people may want to continue drinking effect and amounts of green tea to get these. But the relationship between green tea and thyroid is pretty clear. And they are a good reason to cut back on green tea. Click for more information the effects of green tea, for information on natural remedies, and for information on the benefits of green tea. 1. How are green tea and thyroid related? Green tea is often considered a healthy supplement and a dietary beverage with an abundance in nutritional content. The health potential of green tea is evident in the nutrients it possesses such as amino acids, calcium, chromium, magnesium, Copper, iron, selenium, zinc, phosphorus, sodium, potassium, linoleic acid (LA) and the vitamins B, C & E.It also contains Catechins that is considered a powerful antioxidant, which helps to counter the free radicals damage in the body.Medical research studies have found that Green tea is very helpful in maintaining and protection of the thyroid glands. It has been found that Green tea helps in combating tissues injury to the Thyroid glands that may be caused due to oxidative stress. 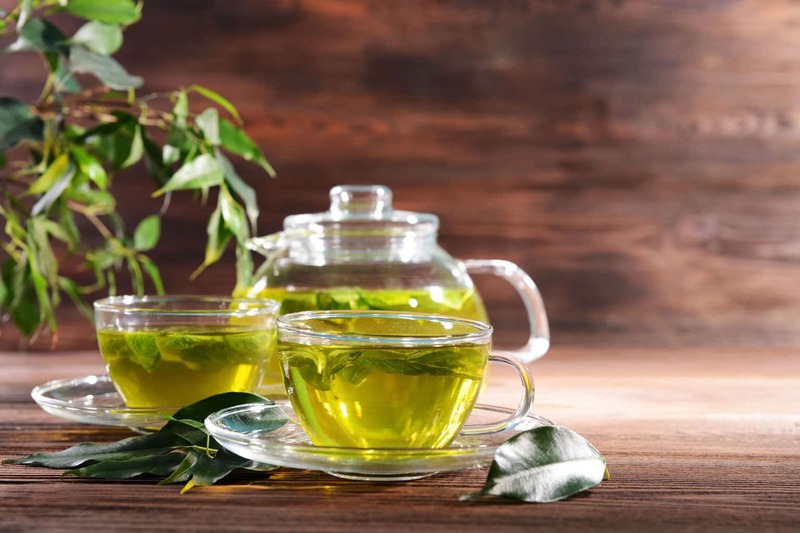 But it is also important to note that the catechins contained in the Green tea can also affect the functions of the Thyroid gland leading to the decrease in T3 and T4 levels. Green Tea is also instrumental in reducing the activity of the deiodinase enzymes which plays a crucial role in activating the thyroid hormones. This is because Green Tea has higher levels of fluoride which can cause a disturbance in the function of the thyroid gland. Fluoride has the ability to displace iodine which can affect the functioning of the thyroid glands. But in moderation, green tea has usually been found to be very beneficial for the body. To make sure that Green tea consumption is safe; one should consult a doctor and check whether one has a thyroid condition which can worsen from the consumption of green tea.Thus individuals who maybe already suffering from thyroid-related diseases such as hypothyroidism and Hashimoto’s Thyroiditis should be cautious of taking high doses of green tea. The quality of the green tea also plays an important role in its effect on the thyroid gland. 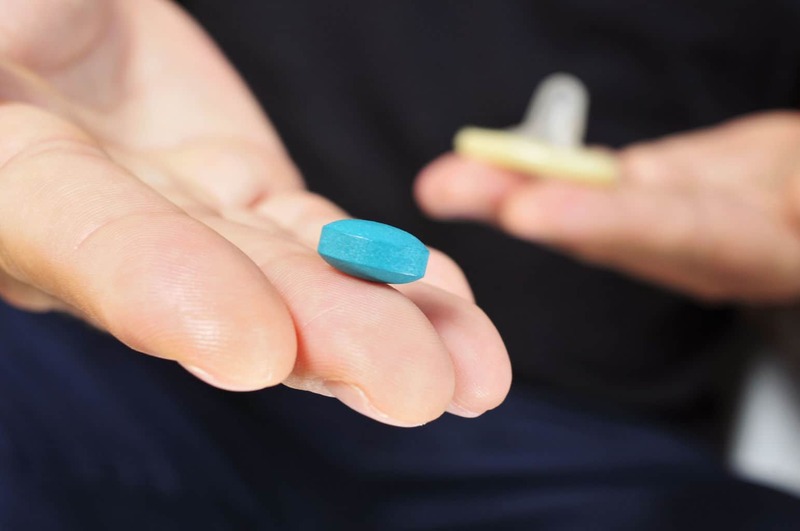 Choosing a product which is cultivated free from insecticides or pesticides would go a long way in protecting the thyroid gland from any harm in the long run. 2. Can green tea affect thyroid? Many studies have shown that when it comes to thyroid issues and symptoms, green tea could be more beneficial than prescription drugs. Those who are affected by thyroid disease are usually sensitive to stimulants but when it comes to green tea, the effects are different. Unlike any other alternatives, green tea has been found to have the potential to accelerate metabolism without causing any overstimulation to the adrenal glands.Green tea is a dried form of tea that is produced without the fermentation process, which results in a minimum oxidation than caused in any other forms of tea. Many studies do prove the high nutritional benefits of green tea which includes proteins, amino acids, copper, iron, selenium, zinc, phosphorus, sodium, manganese, copper, Vitamins B, C & E, and many other nutritious compounds. Green tea is also rich in antioxidants like Catechins and plays an important role in protecting the body from the onslaught of free radicals. The most beneficial aspect of Green tea is that it blocks the toxic effects of Tributyltin which is a toxic compound found in the food chain. Tributyltin has a negative effect on thyroid cells, which the green tea compounds helps to block and thus protect it from oxidative stress. Green tea has also been found very beneficial in managing thyroid associated ophthalmopathy, which is a kind of autoimmune disorder which is characterized by the inflammation of the extraocular muscles and increase in the fatty tissues. But sometimes the green tea can also have negative effects on the thyroid gland. For example, a higher concentration of the green tea compounds can lead to the decrease in the activities of thyroid peroxidase and also to the decrease of T3 and T4 levels in the body.So in some cases, individuals who are already suffering from a mild thyroid disorder can face an aggravated hormonal imbalance due to the compounds in the green tea. Green tea has also been found to contain fluoride which can cause imbalance in the thyroid gland. This fluoride can cause an imbalance in iodine which may cause the dysfunctioning of the thyroid gland. There are also some studies that have proven that though Green tea is very beneficial in protecting the body from different kinds of cancer, it can increase the risk of thyroid cancer. So it is a good step to avoid green tea for individuals who have an existing thyroid disorder. But a moderate consumption of green tea in average healthy individuals has been found healthy and non-toxic for individuals. 3. How are green tea thyroid related? Though the benefits of green tea for the overall health of the human body is lauded in many medical studies, the consumption of green tea may have some detrimental effects to the thyroid gland. It has been found in some studies that the high consumption of green tea can result on goiters or cause an enlargement of the thyroid gland.According to certain studies, green tea extracts at high doses can reduce the activity of deiodinase enzymes which is considered very important in activating the thyroid hormones. The main polyphenol compounds that are found in green tea, also known as catechins have also been found to have detrimental effects on the thyroid glands. Though green tea can be very healthy for those individuals who have a healthy thyroid, the consumption of green tea could be harmful for those who have an existing thyroid problem. In addition, green tea actively absorbs fluoride from the soil and can block iodine absorption in the body thus causing negative effects to the strength and structure of the bones. Green tea has also been found to have a cooling effect and can thus induce hypothyroidism which can be detrimental for the body. For individuals who may be suffering from low iron levels in the body, the naturally occurring tannins in green tea can reduce the absorption of iron in the body and thus can be not beneficial for health.The consumption of green tea has also been found to reduce the T3 and T4 hormones in patients who have an existing thyroid disorder and thus are advised not to take green tea.